NOVA is a valuable resource for our clients’ confidential customized needs because we partner with industry-recognized, experienced suppliers to ensure you receive the highest quality wafer processing services. NOVA has a large selection of prime and test grade silicon wafers available in diameters of 1” to 12” to accommodate your processing needs. Services can also be performed on customer supplied material. You can count on NOVA to provide exceptional customer service, quality processing with quick turnaround, at affordable pricing. 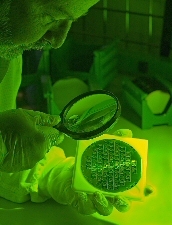 Contact us today to discuss your wafer processing requirements. Contact NOVA for more information on our processing services at (972)478-7002 or submit an online Service Request.